Designed right here in Western Australia, ABC’s Windmaster Blinds have been specially built for Perth’s windy conditions. Most patio blinds or awnings aren’t sturdy enough to withstand the strong winds we experience in Perth. Our popular Windmaster Blinds have been locally designed with WA weather in mind, making them the ideal choice for any building. Not only are they resilient against the elements, but they also have a two-year warranty, so you know they’re made to last. Patio blinds tend to flap about when the wind starts to pick up. Which isn’t just a nuisance, it’s a potential safety hazard. Windmaster Blinds stand the test of time when they’re up against the elements (the name says it all). 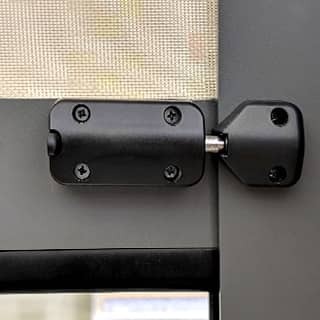 They have been designed with features like heavy-duty base rails, locks and heavy-duty channels to minimise any fabric movement. These blinds can also reduce up to 94% of the heat in your home, which makes all the difference during the stifling summer months. Windmaster Blinds are made using Eco fabric, which is a square hole weave that’s effective in reducing heat. 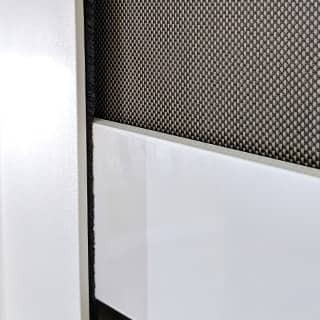 Thanks to the seamless, zip-free design of these blinds, the tight and tensioned nature of the fabric reduces the likelihood of insects entering your alfresco areas. The Windmaster range is easy to customise based on your own preferences. Optional extras include a new 125mm headbox, a 12v motor (no electrician required), 240v motor (electrician required), plus a solar powered wind and light sensor. You can also choose from a range of 20 premium powder coated colours. Our high-quality Windmaster™ Blinds are not only versatile and practical, but they create secure and stylish outdoor entertaining areas. For the best wind-resistant awnings in the market, choose Windmaster™ to protect your home or business. Interested in Windmaster Blinds? These outdoor blinds are available with ABC’s intelligent home motorisation system: SmartHome. This innovative device connects to your home WiFi, allowing you complete control of your window treatments using just your voice or your smartphone.